Now, honestly, most of my week here in Portland has been spent on the couch here on my laptop/reading/playing dumb video games or sleeping in bed. In other words, pain has kept me firmly in its’ grasp. But, we did get out the other evening to go to Winco – the first time I’ve ever been there. And I promptly told my OH (other half) that we will be getting as much products there as we can (our non-dairy and other ‘specialty’ items we will have to shop elsewhere for), for how great are Winco’s prices? Goodness! 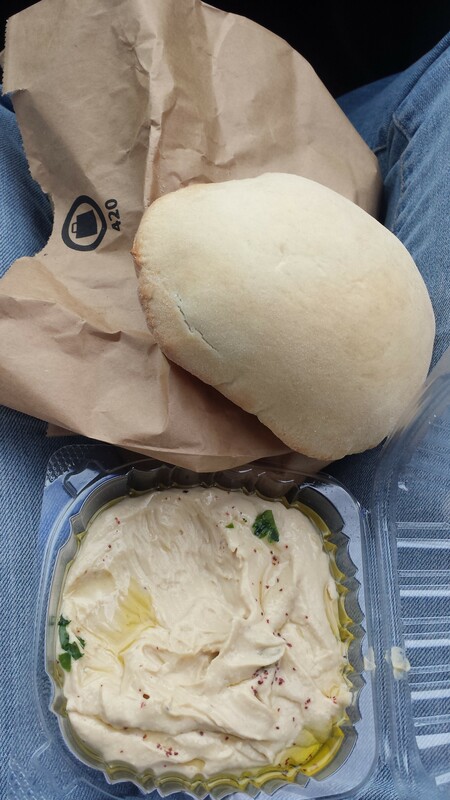 We grabbed some hummus and pita breads from Ya Hala restaurant (a fabulous Lebanese restaurant) because that’s what you do when you come to Portland, you stuff yourselves full of amazingly perfect hummus and steaming hot-just-from-the-oven pita breads. This is one area where I purposefully forget that I am gluten-dairy-egg free because these breads are just too fabulously good. Yes, I have pictures….. 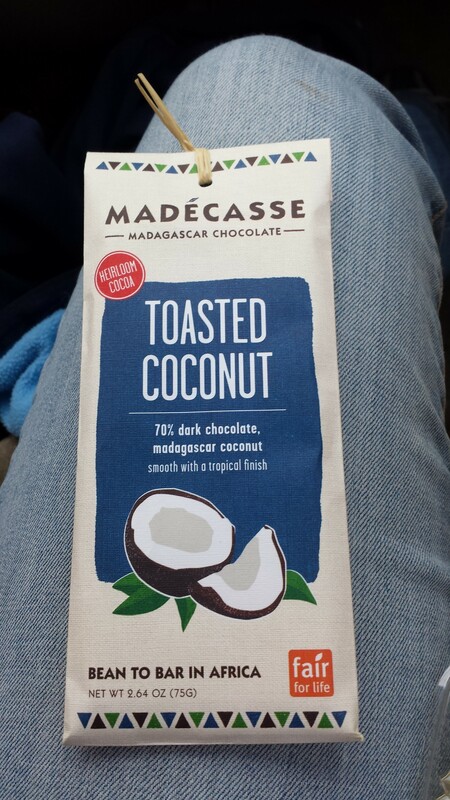 While there we grabbed some amaaaazing chocolate bars. 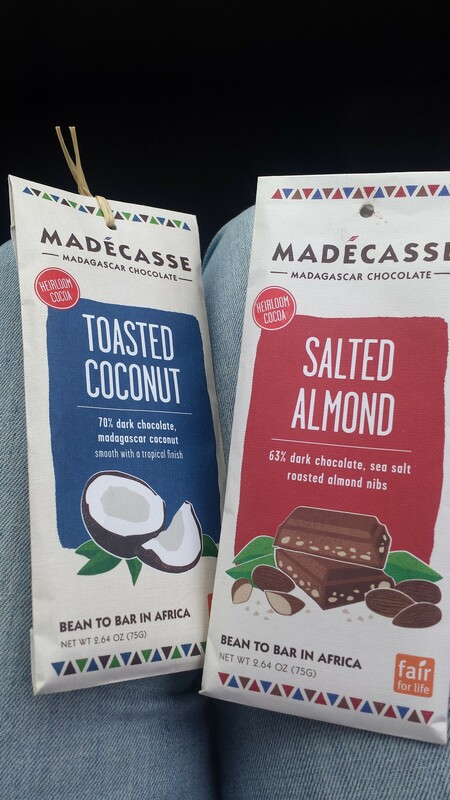 Madecasse madagascar chocolate. MMM, They were a bit spendy for my typical thrifty ways, but sometimes, you’ve just got to splurge. He ate his right away but I decided to wait until we got back to our temporary ‘home’ and savor it. Which I was glad I did because then we ended up getting something that went perfect with it…. Oh and here’s another picture of the treats we grabbed, and yes, i knew if i didn’t take pictures in the car, using my lap as the ‘backdrop’ I’d end up with no pictures at all. So, wipe the drool off your chin and don’t judge my fading jeans. One other thing we did last night. We found our dream house. No, there’s probably no way ever that we will be able to buy it, but we both fell in love with it. Sigh. It’s fun to dream though. ummm YUM!!! particularly the hummus/bread! once we are moved here and you guys come visit, trust me, we’ll be taking you to Ya Hala!!! YUM YUM YUM. This looks great! it was a treat for sure!!! oh my gosh those chocolate bars sound delicious! 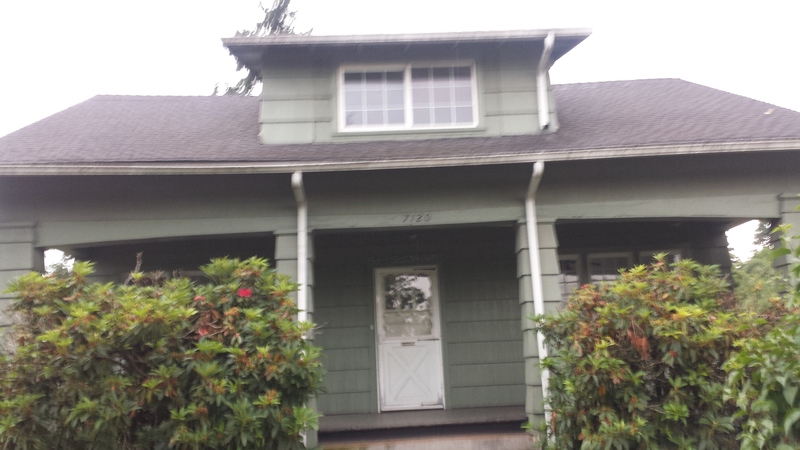 That house is adorable – we found our dream home just around the block and it’s actually up for sale now.. but no down payment yet. Oh well, home is where the heart is right? 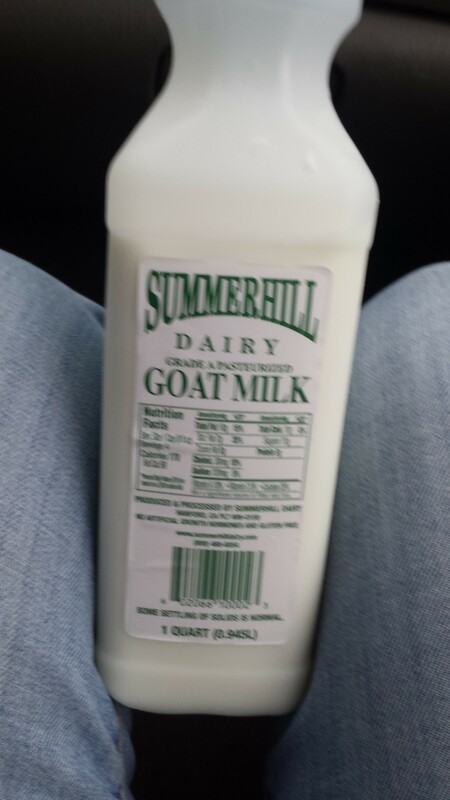 I have never tried goats milk. I’ve always wanted to. I love hummus! Looks delicious! we’re going to be in portland in a few weeks, so i’ll have to keep this in mind! 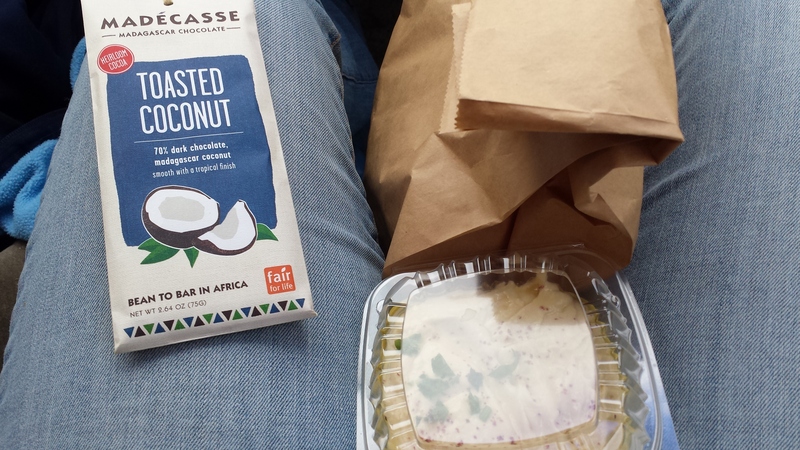 We’ll take the hummus and the toasted coconut chocolate, thanks! 🙂 all looks delicious! 🙂 I agree But we found out it’s sale pending already. It is in God’s hands though. Okay, dying at the picture of the hummus and bread. It’s so fluffy looking! I loooove almond milk too! That almond chocolate looks like it was probably amazing! OH man, I love affair with hummus and red bell peppers! 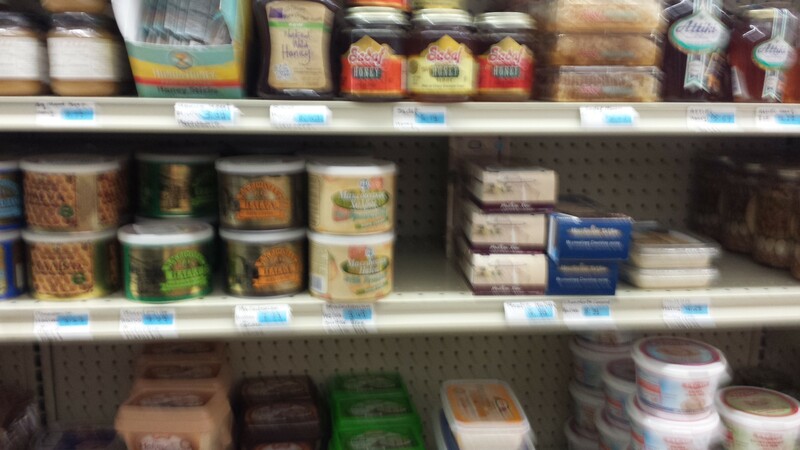 I love ethnic grocery stores! The chocolates and hummus look delicious!!! I definitely am addicted to it! YUM! that hummus looks incredible!